REDONDO BEACH — Boaters at Redondo Beach’s King Harbor have waited quite a while for repair work on a boat hoist to be completed. The light at the end of the tunnel, however, is slowly brightening as repair work on one hoist was scheduled to begin just as the unofficial boating season comes to an end. Councilmember Bill Brand confirmed repair work on one hoist was scheduled to begin last week and continue through mid-October. The hoists at Redondo Beach’s King Harbor have been closed since late 2014. City officials originally forecasted repairs would be completed by this month. “It will be returned to service by Oct. 15, barring any unforeseen circumstances. We’re working to finish as soon as possible, so it may open sooner,” Brand, whose district includes Redondo Beach Harbor, said. City staff posted updates on Redondo Beach’s website to inform boaters of the hoist closure. The updates notified boaters of alternate boat launch facilities at Marina del Rey and San Pedro. Another post stated the north hoist would be operational by August or September. Boater Ron Carlson asked The Log last month when the hoists would be operational. He followed up a couple weeks later, explaining how the inoperable hoists and lack of launch options impacted him. Sam Elder, a Redondo Beach resident and boater, shared with The Log a petition he started to have the hoists retained, repaired and updated. “They have no other way of putting boats in or taking them out,” Elder said, adding Redondo Beach is only working on upgrading one hoist. City officials have reportedly sought to build a boat ramp as well. Any plans to build a boat launch ramp, however, would need to be approved by the California Coastal Commission, which could take months, if not years, to green light. In the meantime no boats are being launched at King Harbor. Elder said launch options were available in Long Beach or Marina del Rey, though neither location was ideal. All boaters had to worry about fuel costs to boat around the Palos Verdes Peninsula or navigate south from Los Angeles’ Westside. Anglers had the additional worry of keeping bait alive. Launching from Long Beach was even more complicated, Elder said, because a two-lane boat launch ramp there resulted in significant congestion. There were also questions of whether one hoist would be sufficient to handle boat traffic at King Harbor. City officials reportedly received bids on the second hoist, but whether Redondo Beach will actually make any repairs is uncertain. Elder shared a letter with The Log he reportedly penned on Aug. 9, requesting the Redondo Beach City Council retain both hoists, claiming they were more beneficial to boaters than a planned a two-lane boat launch ramp. 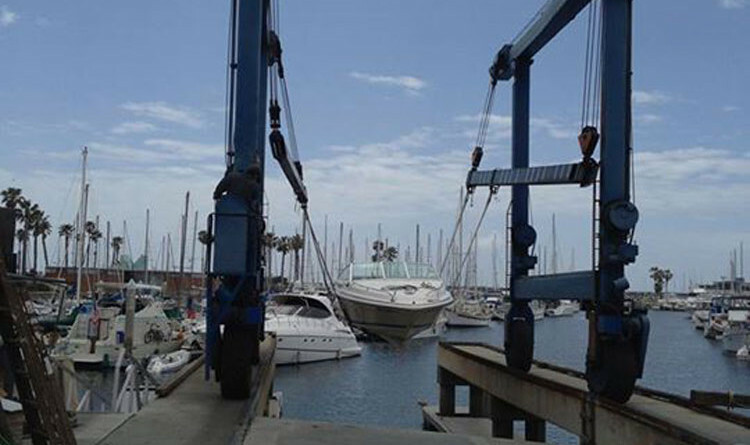 The hoists allow boaters to insert their respective vessels into the harbor without submerging boat trailers into saltwater and require “more physical exertion and strength” to launch a boat,” Elder explained. “Hoists afford access. Ramps do not,” Elder’s statements read. Carlson said some are still in the dark about future plans. He added traffic could be a concern once the hoist is operational again. The hoists were reportedly used 1,225 times in 2013. Redondo Beach allocated nearly $250,000 to repair one of the hoists.